Yeah, it’s a fantastic series. But FYI, Hobb will rip your heart out of your chest and stab it in front of your eyes. In every damn book. I sometimes wish she was a less talented writer, who didn’t make me care about her characters. Assassin’s Apprentice is a magnificent novel, and the whole series is great, but I’m with CarolC – be prepared for some major, major heartbreak. Folks, I thank you both for not mentioning all the corrections I had to make to the review. Ugh. Still I think I know what you mean about Hobb’s ability to get the hooks in. I got a little teary about the sequences involving Fitz and his puppy familiars. The writing is such a counter to the offhand manner of other writers, such as Jordan for example, that not only am I engaged emotionally – I am left in admiration at the woman’s sheer talent. 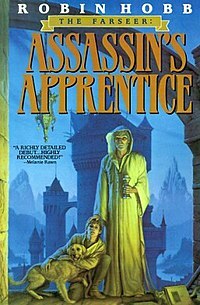 Oh and it is was a very long read for me, I spent the entire day ploughing through Assassin’s Apprentice. I look forward to the days when I can sit down with the rest of the Farseer trilogy and take my time.